Forget what you know about the weather. In so many ways, Maui is different! Our weather is controlled by the two massive mountains that make up our island. Without our mountains, annual rainfall would be about equal to that of Arizona! But these weather-makers are here to stay, and they create stunning diversity – arid desert that sees as little as 10 inches a year lies within a few short miles of lush rainforest that can see among the highest recorded rainfall on earth! It’s no wonder the forecasts you see are all wrong! There are inaccurate/overly generalized rainfall maps of Maui out there – many being made for different tourism interests. Below is a Google map with untouched historical data from the University of Hawaii overlaid. – Flat, windy valley between two massive mountains. – Mostly desert, dry and sunny virtually all the time. – Cloud cover often comes in as the day progresses. – Strong rains come more often in winter from large storms. – Temps are a few degrees warmer than the Central Maui averages above. – Strong rains come mostly in winter from large storms which often hit this side much harder. 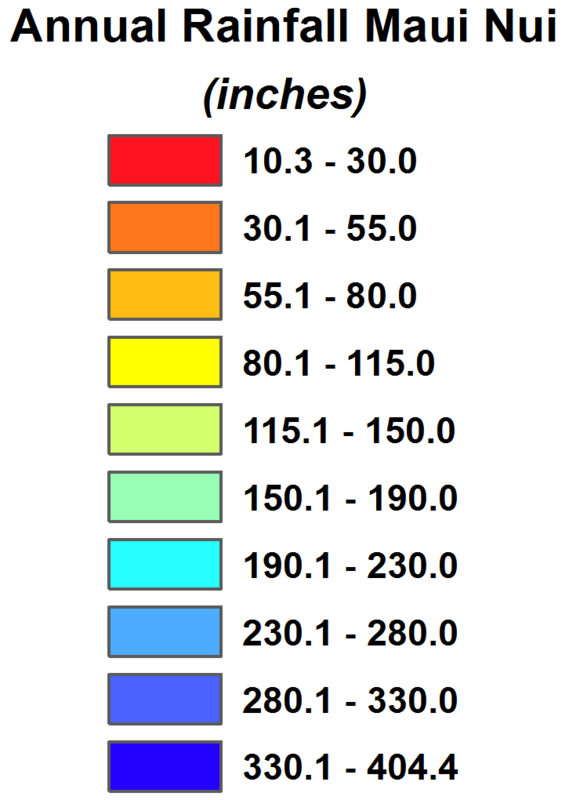 – Temps are a few degrees cooler than the Central Maui averages above. – The majority of rain comes late in the day and overnight. 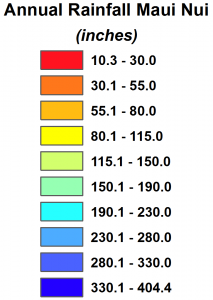 – Higher elevations (between 2,000 and 4,000 ft.) get significantly more rain than coastal areas. – Much of this area is often shielded significantly from the larger storms. – When the inversion layer is not present, and temperatures dip, it can snow at the summit. Surprise, the Forecast Was Wrong! When many visitors look at the Weather Channel or some other trusted weather resource from home, they mistakenly believe it always rains on our windward side – or will postpone a trip to Hana day after day because it looks like it is constantly raining – don’t make that mistake! Your best bet is to understand our weather by reading this page, then use the text description of the weather on our sidebar (to the right of every page) which will give you the info you need to understand. Yeah, it take a few more brain cells than the cute sun and cloud graphics – but once you apply your new understanding, you’ll be planning the best activities for your days and even outsmart some long-time Maui residents! The majority of our weather is highly predictable as it is created by a localized daily cycle of the sun heating ocean, clouds and winds forming as the day progresses, and the winds blowing these clouds into the mountain, where they are forced upward until they hit the inversion layer. The clouds stack up against this wall (usually between 4,000-7,000 ft) as the day progresses which expands the cloud cover more and more toward the lower elevation areas. Most rain for these lower elevations (almost exclusively where people live on the windward side of Maui) conveniently comes in the afternoon and overnight. Contrary to what you may have been told, most big storms actually thrash the normally dry resort areas, and lightly kiss the normally wet jungle areas. The cause? The same force that keeps the leeward areas dry from the trades: the massive mountains! You see, just like the mainland, most large storm systems come from west to east. These flip our normal daily tradwind pattern as the storm system slams into the west-facing slopes of the mountain. The Western Regional Climate Center has a very detailed and accurate description of our climate here. Map Reference: Giambelluca, T.W., Q. Chen, A.G. Frazier, J.P. Price, Y.-L. Chen, P.-S. Chu, J.K. Eischeid, and D.M. 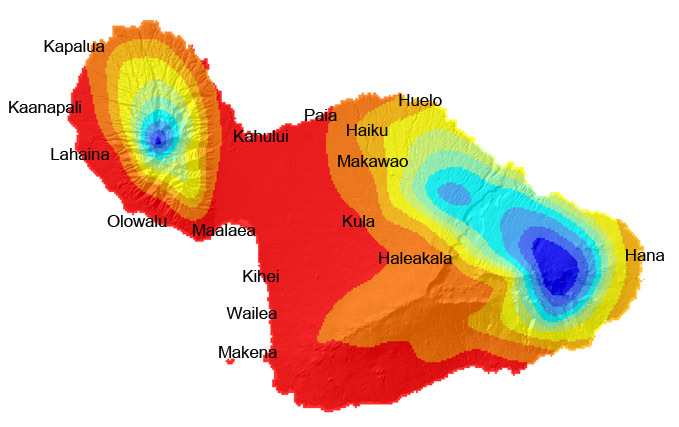 Delparte, 2013: Online Rainfall Atlas of Hawai‘i. Bull. Amer. Meteor. Soc. 94, 313-316, doi: 10.1175/BAMS-D-11-00228.1.